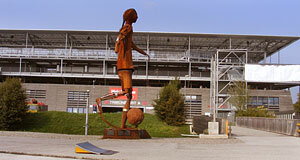 In the late 1990ies, a great deal of controversy arose in Salzburg over the construction of a new football stadium. At first, it looked like those against the construction were about to succeed with their campaign – until regional politics took over and the governor of Salzburg granted all necessary building permissions, in full accordance with a "panem et circenses" philosophy. In 2003, the new stadium of Salzburg was completed, right between the Rococo palace of Schloss Klessheim and the Europark Shopping Mall. The latter one and the motorway had already destroyed the Baroque geometry that had once linked Klessheim with the district of Mülln. By 2003, the new football stadium seated up to 18,000 people; not enough for the European Championship that was to take place in Salzburg in summer of 2008. Therefore, the still new stadium was extended and modernised, so that it now seats up to 30,400 people. In addition, the stadium got its own motorway exit, a parking lot with 2,000 spaces, a bus link and a station for local trains. The main criticism that had been raised against the building was related to the vicinity of Schloss Klessheim. Therefore, the construction is partly under ground and does not stand out very much; in addition, a wooden façade was built to make the Salzburg Stadium less prominent. The surface covered by the stadium is 180 by 160 metres. The green is artificial; there are various facilities in the stadium that sell snacks and drinks. The local football club is sponsored by the energy drink Red Bull and thus called "Red Bull Salzburg". After the opening of the new stadium, going to football games was a fancy thing to do for a while – even for people with little or no interest in football / soccer. This was mainly due to the show-elements that Red Bull introduced, such as US style cheerleading and similar things that seem to appeal to the nouveau rich (of which Salzburg got plenty). The old football stadium, by the way, was located in the district of Lehen in a rather unpleasant corner in northern Salzburg. At latest after the European Championship, the new passion for football cooled down a little and now the football games are usually followed only by "real" football aficionados – the fashionable feel of going to the stadium has been worn down.